Redneck Revolt. Some rights reserved.This article is in Series 2 on ‘confronting authoritarian populism and the rural world’, linked to the Emancipatory Rural Politics Initiative (ERPI). An overview and links to Series 1 can be found here. The election of Donald Trump, coupled with the growth of right-wing populism around the globe, has spurred considerable reflection about the multiple divides that stratify the current US political spectrum, particularly the urban/rural and racial rifts. Rural and working-class whites have received special scrutiny for their higher-than-expected turnout, and are often casually portrayed as the root cause of Trumpism. While support for Trump, and the right-wing populism he tapped into, is definitely high among rural whites, it is by no means total. In fact, the spread of Trumpism has also inspired the spread of efforts to counter it. The story of one group in particular, Redneck Revolt, provides a glimpse into emancipatory efforts across the rural US. Ultimately, their work shows that the US left has too easily abandoned the countryside to regressive forces, and suggests that challenging Trumpism requires challenging liberalism itself. Growing out of a rural Kansas mutual aid society called the John Brown Gun Club, one of Redneck Revolt’s main projects is to recruit away from white supremacist organizations. Thus much of their strategy is built around working in the kinds of places that most leftists – and definitely the Democratic Party – know very little about: rodeos, NASCAR rallies, and country music concerts. As Trump’s right-wing populist parade sowed fear and anger across the country during the 2016 presidential campaign, Redneck Revolt also expanded; there are currently more than 30 chapters across the US. Redneck Revolt echoes libertarian concerns with government authority, and they use this as a starting point to engage with rural and working-class white communities. For instance, Redneck Revolt strategically engages with right-wing and nativist “Patriot” militia groups, such as the Oath Keepers and the III% movement. Through persistent work they have achieved measured success, convincing some members of these groups to jettison their xenophobic and white nationalist ideologies. In 2016, as the Standing Rock Sioux escalated their struggle against construction of the Dakota Access Pipeline, Redneck Revolt addressed a recruitment pamphlet to the right-wing Patriot movements: there is no necessary reason, they argued, that “the white working-class … [should] find solidarity with rich white ranch owners against the government, but not working-class people of color defending their own land and community.” This emphasis on community self-defence is consistent with Redneck Revolt’s libertarian-socialism, which broadly promotes self-organization over government authority. This emphasis on community self-defence is consistent with Redneck Revolt’s libertarian-socialism, which broadly promotes self-organization over government authority. Thus, like most of Trump’s rural supporters and the National Rifle Association, Redneck Revolt believes that firearms are central to freedom – a position that clearly puts them at odds with many on the US left. However, their promotion of armed self-defence is firmly articulated with collective notions of freedom, rather than the individual freedoms which drive Trumpism. 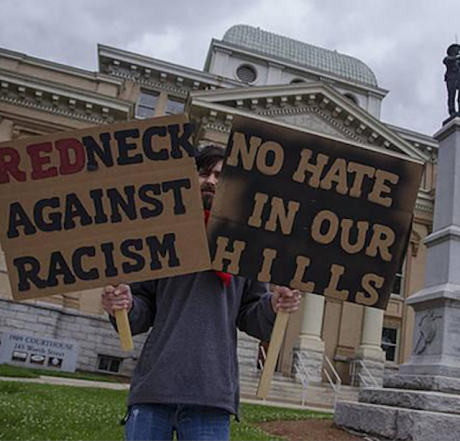 For instance, through alliances with organizations like Black Lives Matter, Redneck Revolt contributed to community self-defence in support of Confederate monument removal in Charlottesville, Virginia last year. Cornel West reported that Redneck Revolt and their allies saved his life when white nationalist protests turned violent. There are several important lessons here for the US left. First, it is possible – and I would argue necessary – to organize in the countryside. Not only are there lots of rural people who don’t fit the Trump demographic, but working-class whites are also not inherently conservative. Second, Redneck Revolt’s success derives from their critique of US liberal orthodoxies. They draw from various radical left traditions to challenge the institutionalization of oppressions through the capitalist state. Their position on firearms, for instance, highlights how white liberal desires for increased governmental gun control often denies the crucial fact that US police and military forces commit sanctioned gun violence against (black and brown) people around the world daily. Finally, Redneck Revolt doesn’t try to organize poor white folk by invoking the tepid liberal language of “white privilege,” because they know that this doesn’t resonate with their experiences of poverty. They position themselves as part of working class and white rural communities and try to convince their neighbours that their lives will only improve “once we abolish our allegiance to white supremacy, and stand for the same liberation for all people.” They don’t talk about diversity and inclusion, but act in solidarity with oppressed peoples. The case of Redneck Revolt suggests there are promising alternatives to Trumpism emanating from the US countryside too often ignored by the US left.